This training is recommended for organizations at the beginning stage of establishing their PBB capabilities. 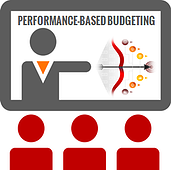 Performance-Based Budgeting (PBB) is an effort to turn dollars into results, by outlining a general chain of cause-and-effect. It is a way to allocate resources to achieve specific objectives based on goals, priorities and measured results. This training course covers an introduction to PBB, core approaches and methodologies that can help establish and successfully manage your PBB framework. The course includes same topics as PBB Express course, offering more detail on each topic with workshops and exercises on how to define programs, activities, performance measures and other PBB elements. "Neubrain staff was highly effective in training our MBA students the fundamentals of business analytics."